Frequency of disaster events over a period of time. Provides supplemental disaster grant assistance to state and local governments and eligible private non-profit organizations for debris removal; emergency protective measures; and the repair, replacement, or restoration of publicly owned facilities. The federal share of assistance is no less than 75% of the eligible costs for emergency measures and permanent restoration from a presidentially declared disaster. 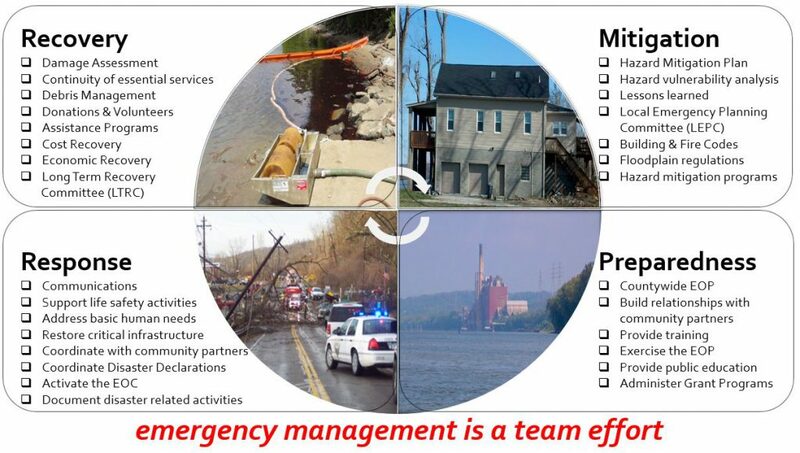 Administered by the Ohio EMA Disaster Recovery Branch, the SDRP is designed to provide financial assistance to local governments and eligible non-profits impacted by disasters. The estimated cost of the disaster must exceed a county-wide per capita requirement ($3.57 x county population). Applicants must demonstrate that the disaster overwhelmed local resources and that other avenues of financial assistance have been exhausted. The Governor must provide written authorization and the State Controlling Board must approve the request. The cost of the disaster as well as the impact of the disaster will be considered when evaluating the request. Once authorized, eligible applicants must follow the application process. The Hazard Mitigation Grant Program provides grant funding for communities to implement hazard mitigation measures following a Presidential disaster declaration.